Renaissance at Manchester is located on Route 70 in Manchester Township in Ocean County, New Jersey. This golf course community is open to adults aged 55 or better. This community is perfect for active adults looking for a peaceful feel in a tranquil setting. It has plenty of wide open spaces as well as many lakes within the community. Renaissance at Manchester is conveniently located half-way between Philadelphia and New York City and is about four miles from Garden State Parkway. Despite its rural setting, this gated active adult community is close to stores, restaurants, entertainment, and medical services. Major malls are just 15 minutes away. Amenities include a private 18-hole executive golf course and a spectacular 30,000 square-foot clubhouse. Indoors, the clubhouse contains a large state-of-the-art fitness center, an indoor pool, a library, computers, billiards room, woodworking shop, and a ballroom. There are also several activity rooms for social gatherings, cards, as well as arts and crafts. Outdoors, residents can enjoy basketball, tennis courts, horseshoe pits, as well as shuffleboard and bocce ball courts. Homeowners can go for a refreshing dip in the pool, complete with spa and patio. There is also a playground for kids, a spacious RV parking area, and an on-site deli. Designed by J. Christopher Cummins, the 18-hole, par 63 Renaissance golf course features 4,262 yards of golf from the longest tees. This 55+ community is comprised of over 1,900 single-family homes which were built between 1997 and 2007 by Carlton Homes and Centex Homes. These bright and airy residences with elegant, open floor plans offer between 1,522 and 2,256 square feet of living space with one or two bedrooms, two bathrooms, and an attached one or two-car garage. 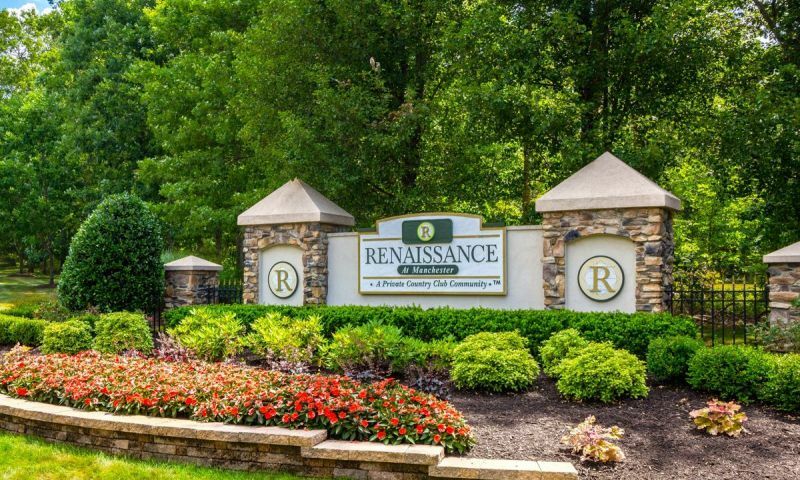 Many of the houses in Renaissance at Manchester are situated on private and golf course lots. Pet owners will be happy to know that the porches or decks that come with many of the homes can be closed off to keep their four-legged friends safe and secure. In addition, the residences in this community feature expansive kitchens as well as a magnificent master bedroom and bath suites. Some homes feature dens on the first floor. The monthly homeowner's association dues are very reasonable for a community of this size. Besides housing an impressive golf course, this 55+ community offers lots of activities for a healthy and active lifestyle. Residents can join any of the many social clubs in the community, such as an artists club, book club, ping pong club, woodworkers, cooking club, men's group, women's group, music club, model builders, red hat society, grandparents group, or even the martial arts club. Outdoor activity groups include golfing, gardening, and softball. Residents also get together regularly for bingo and card games. In addition, the full-time activities director plans many community events. Renaissance at Manchester is situated on Route 70 in a peaceful, tranquil section of Manchester Township. Residents enjoy easy access to popular attractions along the Jersey Shore, including Point Pleasant, Lavallette, and Seaside Heights. The Garden State Arts Center is 35 miles away. The major cities of Philadelphia and Atlantic City can be reached within an hour and lively Manhattan is only 90 minutes away. With its close proximity to several major roadways including Garden State Parkway, Highway 37 and 70, as well as Route 9, it is easy for residents to explore the surrounding area of Manchester. There are many stores, malls, restaurants, and medical facilities nearby. Renaissance at Manchester is an ideal established active adult community in Ocean County, New Jersey. There are plenty of activities available in Renaissance at Manchester. Here is a sample of some of the clubs, activities and classes offered here. Homes range in size from 1,522 to 2,256 square feet and feature one to two bedrooms, two bathrooms, and a two-car garage. Large community with large clubhouse. Some homes could use updating, however most floor plans are nice and open. Gary and I moved here a few years ago and really like it. The location is nice because it's quiet and private but still close to all the things you need often like shopping and restaurants. We've got all the amenities we could ever need here, the golf course is nice and the clubhouse offers something for everyone. I'd say some of the facilities could use some updating, but overall, the community is well maintained. The people here are friendly and there are tons of different activities. 55places.com is not affiliated with the developer(s) or homeowners association of Renaissance at Manchester. The information you submit is distributed to a 55places.com Partner Agent, who is a licensed real estate agent. The information regarding Renaissance at Manchester has not been verified or approved by the developer or homeowners association. Please verify all information prior to purchasing. 55places.com is not responsible for any errors regarding the information displayed on this website.